NC administrators must show positive traits and leadership in order to represent the school and build needed relationships with students . Hanging as a reminder, this sign stands in the hallway in the center of school leading from malfunction to the cafeteria so that everyone sees the traits expected from a warrior. “For me it's fun, this is my chosen profession, I like kids, I like the energy, I like to have fun, and if were having fun were probably doing better,” NC’s principal Bucky Horton said. Cycles of leadership and new administration peddle through schools on a yearly basis. In the past three years three new major administrators took the helm of the North Cobb community. When Dr. Philip Page left North Cobb to pursue an assistant superintendent position for Cobb County Schools in 2015, then assistant principal and athletic director Bucky Horton became appointed to principal. These skips and position changes drastically change student life, yet rarely do students contribute to decision making or even understand what the process of becoming a principal or even an administrator entails. “Technically you have to have three years minimum of experience in the field, and a masters degree in educational leadership, or take a handful of courses through something called an add-on with an ending test to qualify you,” NC’s principal Bucky Horton said. The years of education and experience will not get the candidate the job alone, to achieve an edge on the competition for the scarce roles, they must go above and beyond expectation. Fortunately for NC, our principal worked with the previous one for years, and tout holding a similar mindset as an asset for transitioning from principal to principal. Horton boasts a similar record as Dr. Page who left three years ago to pursue his higher administrative position in the county where he would oversee nine west side schools and continues on similar perspectives on school spirit and continuing rich North Cobb traditions. “I never felt like I was filling in for him because he and I are friends. We have a lot of the same ideas and philosophies. We are different but both very student oriented, and I believe that climate is everything,” Horton said. At the end of this past 2016-2017 school year, Jared Noblet, one of NC’s assistant principals and the acting athletic director, left to pursue a possible principalship in the future, according to Principal Horton. 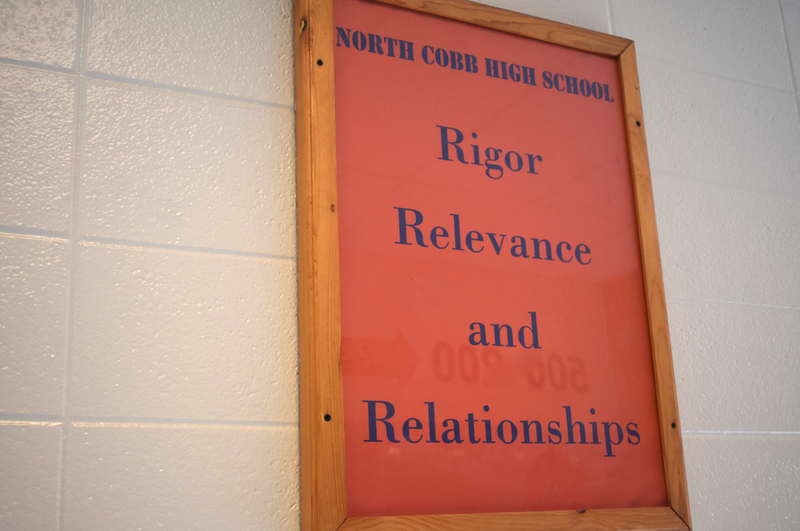 No small task, Noblet must explore experience in multiple schools, ages groups, and places just to meet the expectations of Cobb County’s Board of Education. His replacement, Matthew Moody, assumes his previously held duties of looking over the ninth grade class in the Freshman Academy. Moody now makes up one of eight NC assistant principals all designed to hold a ratio of administrators to students. “I think that [NC] and Campbell have the two largest admin teams but we are also the two largest schools in the district,” Horton said. When asked to name the administrators, the average student can name only half of them. 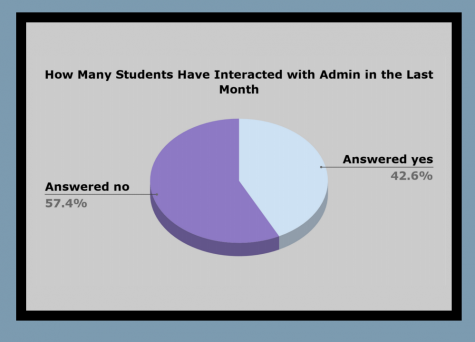 In a social media poll of sample North Cobb students, 43% had interacted with an administrator in the past month. “I don’t know who half of them are [administrators]. I assume that means they have jobs that don’t directly interact with students… but that’s a lot of admin,” junior Coleman Dupius said. Some administrators hold strictly behind the scenes jobs, spotted only monitoring the hallways or hunched over piles of paperwork. There’s no specific description for all of them but the height of the job of an administrator for a number of them resides in their communication with the community and their already clearly outlined expectations through the school. The best administrators develop relationships with students and work for their wellbeing. Besides disciplinary action and conferencing, administrators must mentor struggling student academic data, deal with keys, surplus furniture, meet with parents, sit in on school wide and county wide meetings, handle testing and supervision, work to assign textbooks, schedule events, and supervise and attend athletic events. And that’s just the tip of the academic and social iceberg that administrators must handle during their 210 days of the school year. Respondents from NC, through a social media poll, indicated a lack of communication or interaction with administrators within a months time. 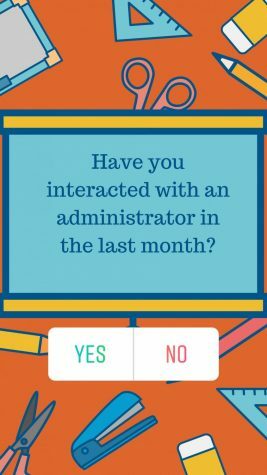 This poll means 57% of students never spoke to, waved at, or even smiled at an administrator at all this month. With years of teaching and administrative experience, assistant principal and magnet coordinator David Stephenson connects to Magnet kids on a specialized level, and the smaller class of Magnet students use Stephenson as their outlet, connection to academic support and guidance, and communicative administrator for decisions. “Stephenson knows all of our names. You can tell that he memorizes the freshman roster,” Magnet junior Eva Drobney said. Students rely heavily on the decisions of the administration. They connect them to Horton who must manage the entirety of the school, as well as any underlying rules or punishments, and they must exemplify the NC Warrior mentality . “I usually only interact with Stephenson but that’s because I am on Magnet advisory council. 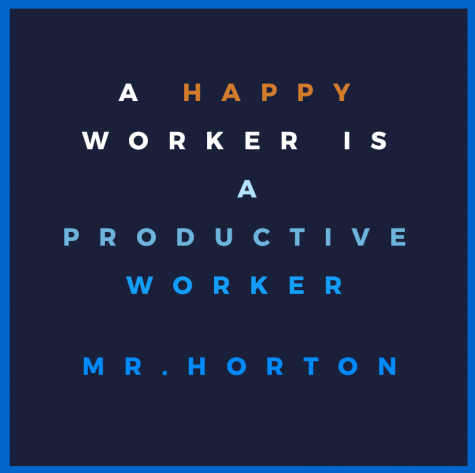 I don’t know that I ever have interacted with Mr. Horton, but he is a busy man,” Dupius said. For Horton, the principal of NC takes a uncommonly observant stance, allowing himself to play behind the scenes to help develop an accepting and happy school climate. This stance requires adjustment from students, many still trying to know him in his third year. Horton most importantly holds NC in the highest regard, bringing his own children to attend the school and wants to remedy the issue of a lack of administrative presence. Horton walks the halls regularly in order to push and encourage a helpful, happy environment for the students of NC. No position in the school garners as much attention as that of administration, making regular appearances at games, on Tomahawk Today, and dealing with the blame for events in and out of their control. Heightened tensions with national events and domestic spats soured appearances, causing students to recently organize walkouts and protests, placing no small hurtle infront of those in charge. Cobb County held a strong stance of punishing those who protested, and the administration, regardless of personal opinion, must uphold what their bosses tell them to do in order to ensure the safety of students and staff. These administrators must uphold the guidelines and instructions given to them by their employer, despite their students’ wishes. If they chose to defy their superiors’ instructions, they would experience punishment themselves and it could derail some of these administrators’ wishes to pursue higher positions in the future. No matter what they choose, criticism will follow, and so will the dissenting opinion, and administrators are all too aware of criticism. “Not matter what is going on, we the adults in the building are primarily concerned for the safety of the students,” Horton said.